RBTH presents a selection of views from leading Russian media on international events, featuring reports on Ukrainian President Petro Poroshenko’s meeting with his French counterpart Francois Hollande, Cristina Kirchner's visit to Moscow, and the effect the Ukrainian conflict has had on cooperation in the Arctic ahead of the meeting of the Arctic Council on April 24. The daily tabloid Moskovsky Komsomolets reviews Ukrainian President Petro Poroshenko’s visit to France, where he held talks with his counterpart Francois Hollande. "We discussed the situation in the east of Ukraine and, specifically, the implementation of the Minsk agreements. Violations of the ceasefire regime and the presence of heavy weaponry are still being registered," said the French president. 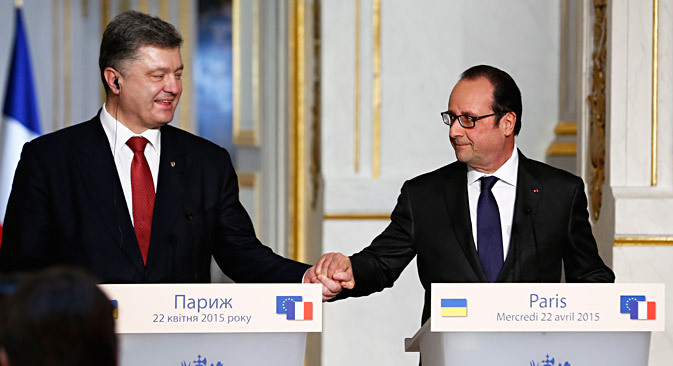 Poroshenko reiterated the words of his French counterpart by saying that the Minsk peace agreements are the only way to resolve the conflict in Ukraine. According to the newspaper, Hollande said that a vote on the association agreement between Ukraine and the EU will be held in the coming months. The French president expressed confidence that the agreement will be ratified. In his turn, Poroshenko spoke about the abolition of visas for Ukrainian citizens by the EU. He expects that the visa-free regime may be introduced as early as from January 1, 2016, writes Moskovsky Komsomolets. Hollande once again returned to the issue of the delivery of the Mistral helicopter carriers, which he plans to discuss with Russian President Vladimir Putin on April 24 in Yerevan, where the two leaders will participate in events commemorating the centenary of the Armenian Genocide, the newspaper reports. Delivery of the French-built carriers to Russia was suspended last year due to Moscow’s role in the Ukrainian crisis. However, the French president stressed that the delivery of the Mistrals to Russia is not possible in the current context; according to him, it is due not only to the fact that the Minsk Agreement has not yet been fully implemented, but also because France has no intention of supplying the Russian side with lethal weapons. At the same time, Hollande expressed an understanding that the money will have to be returned in the event of non-delivery, says Moskovsky Komsomolets. Vedomosti runs an article ahead of the visit of Argentine President Cristina Kirchner to Moscow on April 23. The newspaper notes that bilateral relations between the two countries will reach a new level after an agreement on a comprehensive strategic partnership is signed at the Kremlin. The document will be augmented by agreements on military cooperation between the defense ministries, on environmental protection and combating illicit drug trafficking as well as memoranda of cooperation between the agriculture and industry ministries, the newspaper adds. Argentina produces a wide range of scientific and technical as well as agricultural products and could meet many of Russia's needs, Moscow State University professor Vladimir Borodayev told Vedomosti. Kirchner’s visit to Moscow is taking place against the backdrop of deteriorating relations between both countries and the West, the newspaper writes. Kirchner has found in the Russian leader an ally in the confrontation with US hedge funds over restructuring Argentina’s outstanding debt. In addition, in 2014 Kirchner supported Russia's takeover of Crimea, while Putin called for negotiations between Buenos Aires and London on the status of the Falkland Islands, writes Vedomosti. The business daily Kommersant follows the work of the Arctic Council, telling its readers that the Ukrainian conflict has had an impact on cooperation in the polar region. The newspaper explains that due to political disagreements Canada has refused to sign a legally binding intergovernmental agreement with Russia to combat oil pollution in the Arctic. Because of Canada's position, the Russian delegation despatched to the Canadian town of Iqaluit for the meeting of the Arctic Council on April 24 is headed not by Foreign Minister Sergei Lavrov, but by Natural Resources Minister Sergei Donskoi. According to Kommersant, the application of the European Union for permanent observer status in the Arctic Council is expected to be considered at the meeting. This status gives non-regional states and associations an opportunity to at least indirectly influence decisions regarding the Arctic region, which is extremely promising in terms of hydrocarbon production and commercial shipping development, the newspaper writes. The application was denied in 2013 due to the position of Ottawa, which was outraged by the European Commission's ban on imports of seal meat and fur – one of the main trades of the indigenous peoples of Canada, says Kommersant. Several months ago, Ottawa withdrew its objections, but it is now Russia that is ready to veto the EU application. "When the EU pursues a sanctions policy toward Russia, the context is not quite favorable for making such decisions," the representative of the Russian Federation in the Arctic Council, Vladimir Barbin, stated in an interview with the newspaper. Yemen: Yet another friction point in the Russia-West relationship?